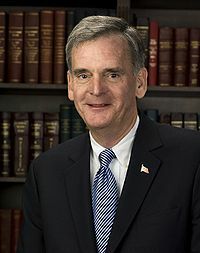 Judd Gregg, born February 14, 1947 (age 72), is the former Republican U.S. Senator from New Hampshire. In his third Senate election (2004) he received the highest number of votes in any election in New Hampshire history, at that time. In 2009, President Obama nominated Senator Gregg to become his Commerce Secretary. On February 12, 2009, Senator Gregg withdrew his nomination, citing "irresolvable conflicts" on issues including the economic stimulus package and the Census. Furthermore, Gregg has announced he would not seek a fourth term for the United States Senate in 2010. Born and raised in Nashua, New Hampshire, Gregg attended Nashua public schools and would go on to graduate at Columbia University in 1969. He received his Juris Doctor from Boston University Law School in 1972 and a degree in tax law in 1975. Gregg would eventually became a partner in the law firm of Sullivan, Gregg and Horton. The first elected office that Judd Gredd held was as a member of the New Hampshire Executive Council, an institution that approves state expenditures and appointments made by the governor. He was elected to the U.S. House of Representatives from New Hampshire’s second congressional district in 1980, and was reelected in 1982, 1984, and 1986. He served on the House Committee on Government Operations, the Committee on Science and Technology, and the powerful Ways and Means Committee. He was elected governor in 1988 and reelected in 1990 (New Hampshire and Vermont are the only states that elect governors to two-year terms, not four). During his tenure he served as chairman of the New England Governors' Conference. Gregg was elected to the U.S. Senate in 1992 and was reelected in 1998 and 2004. Gregg served as ranking member of the Senate Budget Committee, and emphasised conservative policies on the federal budget. In 2006 he authored the Stop Over-Spending Act, which would give the President the power of the line-item veto, add spending caps and create commissions to wrestle with unsustainable entitlement growth and government waste. Gregg has a reputation of supporting lower taxes and reduced government spending, while is a moderate on social issues. He voted against the Federal Marriage Amendment and supports Embryonic Stem Cell Research, although is pro-life regarding abortion. From 2007-2008 Senator Gregg supported the interests of the National Right to Life Committee 85% of the time. He also had an independent streak on the environment and received satisfactory ratings from environmental groups for his conservation efforts of environmentally-sensitive areas of New Hampshire. This page was last modified on 9 April 2019, at 11:07.